Sennheiser headphones and mics are held in high esteem by consumers and audio pros alike, but the company is a babe in the woods when it comes building loudspeakers for the home theater. Based on what we heard at CES of its AMBEO soundbar—an all-in-one 5.1.4 design with no fewer than 13 drivers—Sennheiser will have no problem capturing a slice of the market at the high end. After just ten minutes of snippet listening, one of my audition colleagues declared “It’s the best soundbar I’ve heard at the show. Can I buy one now?” Actually, he’ll have to wait until May and pay a significant $2,499 to acquire one. While my immediate impression was likewise quite favorable, the cynic in me wondered if the rabid enthusiast might be a plant. 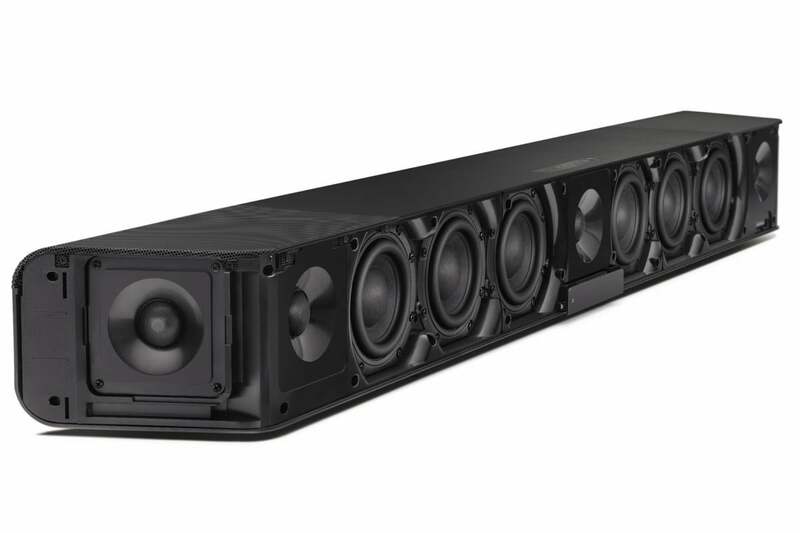 How many of the skidillion soundbars unveiled at the show could he have possibly heard? I also couldn’t help but notice how carefully this dedicated listening room had been set up to achieve optimum performance, with floating ceiling and sidewall panels, and special acoustic treatments on the same. It was hardly your typical CES audition space—high-end audio gear is typically demoed in curtained and carpeted suites at the Venetian. Most telling: While an obnoxiously loud video game soundtrack was blaring from an adjacent booth just outside our listening room door, the quiet inside the Sennheiser show space was akin to that in a sealed anechoic chamber. Still, the seriousness of Sennheiser’s aspirations was also obvious from the git-go in the construct of this bulked-up (yet wall-mountable) speaker, from its lacquered and brushed-aluminum enclosure to Sennheiser’s major splurge on high-performance drivers: Six forward-positioned, 4-inch long-throw woofers; three front-firing, 1-inch alloy fabric dome tweeters; two side-firing tweeters; and two upward-firing, 3.5-inch full-range speakers, collectively driven by 500 watts of Class D amplification. Peel off the posh casing and you’d find this substantial array of 13 drivers, powered by a 500-watt Class D amplifier. The Sennheiser audio heritage is most obvious in the included external microphone, a wand-styled thing of beauty mounted on a stand that’s “used just for room calibration and then put aside,” Voight sighed. Unlike other room-calibration headsets and mics that listeners must position at varied room locations for multichannel sound system balancing, this one is so accurate “you just place it in one location and let it do its thing.” For maximum sound-throwing thrills, this beam-forming speaker rig should be situated in a room with side walls no farther than five meters (16.4 feet) to the left and right of the soundbar, and with a forward throw from bar to back wall of five to ten meters (32.8 feet) max. Also telling is Sennheiser’s developmental collaboration with Fraunhofer IIS, the well-known German research institution. Fraunhofer holds many important audio patents, including one for the multichannel immersive audio codec MPEG-H Audio that is also at the heart of Sony’s 360 Reality Audio project. 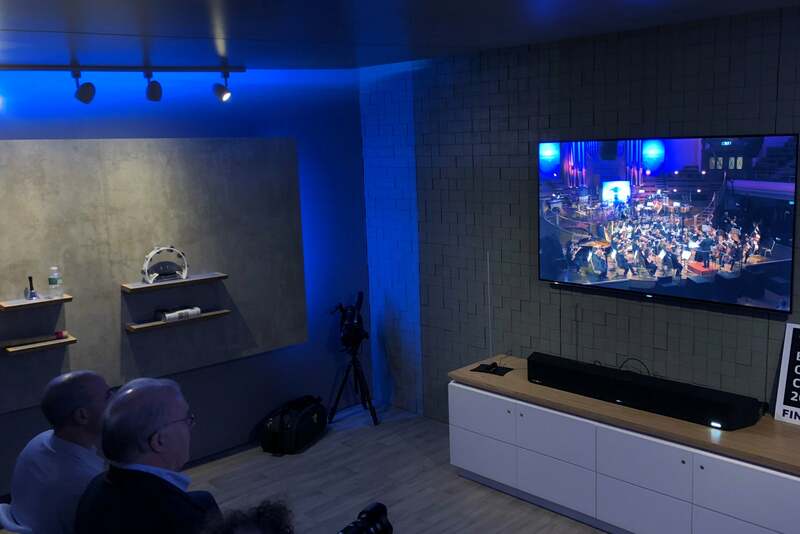 The AMBEO soundbar is likewise compatible with the Dolby Atmos and DTS:X object-based multi-channel formats, Voight said as he played the popular Dolby Atmos “rain forest” clip, along with snippets of performances by classical music ensembles. Sennheiser’s AMBEO soundbar is compatible with Dolby Atmos, DTS:X, and MPEG-H Audio. I didn’t sense that the processing just piled on echo to move the sound outwards, nor did it alter tonal characteristics to make individual instruments pop. There’s more intelligent steering and deception going on here. And Voight hinted that it could be tweaked even more so in the future, via firmware updates to the soundbar and enhancements to its Sennheiser Smart Control companion app, delivered over Wi-Fi. Ready to serve a variety of masters, connectivity options include built-in Google Chromecast, Bluetooth, and the latest iteration of HDMI with eARC (enhanced audio return channel, which provides more bandwidth than first-generation ARC). Users will also find three standard HDMI ports, one optical input, and one analog stereo RCA Aux input. You won’t be able to talk to this soundbar, but Sennheiser is making a good case to just shut up and listen. I’m looking forward to doing that in a more real-world space.